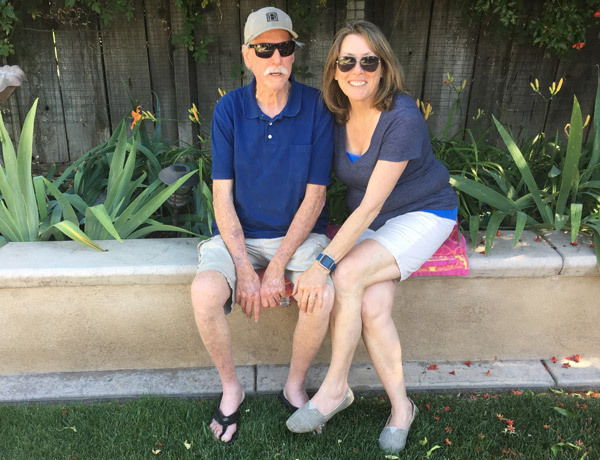 Diagnosed with pleural mesothelioma in 2016, Jim Huff went 15 months with no new tumor growth. His only treatment: A twice-daily dose of CBD oil. When his cancer finally began to progress, spreading to his abdomen, Huff explored other options. Chemotherapy and radiation therapy were still last resorts, and he never was a candidate for surgery. Fortunately, Huff’s oncologist — Dr. Thierry Jahan at the University of California, San Francisco (UCSF) Medical Center — was able to get Huff on the immunotherapy drug Keytruda (pembrolizumab) without enrolling him in a clinical trial. Since starting Keytruda in late February, two CT scans have shown no new tumor growth. He continues to take CBD oil in the morning and evening and THC oil — the psychoactive concentrate — before bed to help with sleep. Huff makes the 65-mile trip to UCSF Medical Center for Keytruda infusions every three weeks. He plans to continue as long as it keeps working. The rash is constant, but Huff controls it with the CBD oil. Doctors tell him it’s a sign the Keytruda is working. While Huff’s tumors aren’t growing, they also aren’t shrinking. Keytruda has a 21 to 25 percent long-term survival rate for patients with PD-L1-positive non-small cell lung cancer (NSCLC), according to a statistical analysis of the KEYNOTE-010 and KEYNOTE-001 clinical trials. The FDA approved Keytruda for NSCLC and several other cancers, not mesothelioma. Most mesothelioma patients get Keytruda through clinical trials or compassionate-use programs. Huff hasn’t had any issues getting access to Keytruda and counts himself lucky to be in the percentage of patients finding success with it. Keytruda and similar immunotherapy drugs can cost $150,000 a year. Luckily, Huff’s infusions are covered entirely by Medicare and private insurance. Huff doesn’t cough much anymore but does tire easily. He’s been taking private guitar lessons between doctor appointments but admits he doesn’t practice enough. Yardwork is left to Huff’s wife these days. He tries to do some cooking and chores around the house. Traveling is limited to day trips and weekend trips by car because Huff refuses to fly without the CBD oil he swears by. And for good reason. Huff had a progression-free survival of 15 months taking only CBD oil. Now he is relying on a combination of the oil and immunotherapy to keep his mesothelioma under control.